Storms across the UK on Thursday left 11 people dead. 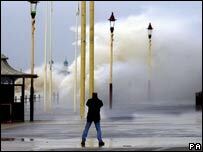 Winds of up to 99mph also caused travel disruption, damaged homes and businesses and left thousands of people without power. Insurers say the repair bill will run into hundreds of millions of pounds. 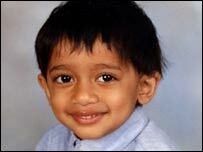 Two-year-old Saurav Ghai was killed when a wall fell on him. He was walking along Southampton Road, in Kentish Town, north London, with his childminder on Thursday afternoon when the 6.5m (21ft) wall collapsed. He was taken to hospital by ambulance suffering from a serious head injury, but was pronounced dead at 1445 GMT. A relative said: "He was a beautiful boy - he was smiling from the day he was born, that's how we will remember him." An airport chief died after a branch fell on his car. 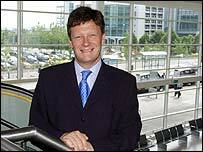 Richard Heard, 49, managing director of Birmingham International Airport, died when a tree branch went through his windscreen. Mr Heard, who leaves behind two daughters aged 18 and 14, had been driving to work at about 0545 GMT on Thursday. His wife Kay paid tribute to Mr Heard as "a caring and loving person - a wonderful husband and father and also my best friend". A 36-year-old man, who was the front-seat passenger in a Ford Fiesta, died when a tree fell on the car on the A329 Reading Road shortly after midday on Thursday. A Thames Valley Police spokesman said on Thursday that the man, from Pangbourne, was pronounced dead at the scene. The driver, who was injured, was being treated at a local hospital, the spokesman added. Christine Doran, 49, of Moston, Manchester, died when her vehicle left the road, overturned and landed part-way in a canal. High winds had blown her lorry off the A629 Skipton western bypass, near the junction with the A59. Ms Doran was certified dead at the scene of the crash by emergency crews. They said the vehicle, which was empty, had been thrown "like a box" from the bridge by the gales. A German lorry driver was killed when his vehicle overturned on the A55 near Chester's Forte Posthouse hotel. Joyce Cosadinos, 60, was crushed to death by a falling wall. It is thought she had tried to shelter behind the 1.5m (5ft) stone wall in Marple, near Stockport, on Thursday afternoon. A gust of wind toppled the wall on to the woman. She suffered serious injuries in the incident and was pronounced dead at Stepping Hill Hospital, Stockport. A 62-year-old man was killed when he was blown into a metal shutter on an industrial estate in the Strangeways area of Manchester. Police said the man had fallen backwards and hit his head. He had been opening the door of his van when he fell. The man, from Salford, was pronounced dead at the scene. Derek Barley, 61, from Manchester, died after being struck by a tree while working on a construction site in Byley, near Middlewich. The accident is under investigation by the Health and Safety Executive. An elderly man was killed after a shed collapsed in Keadby, near Scunthorpe. Firefighters freed the man who was rushed by ambulance to Scunthorpe General Hospital where he died. A spokeswoman for Humberside Police said: "We can confirm that an elderly male died as a result of injuries sustained when a shed roof collapsed on him during high winds." Martin Hunt, 58, was hit by a falling canopy at a petrol station in Bamber Bridge, Lancashire. Mr Hunt, from Broxbourne in Essex, stopped to refuel on his way home. He was putting petrol in his car when a gust of wind took the heavy metal canopy off its pillars and it crashed to the ground. The canopy hit the victim, who was taken to the Royal Preston Hospital suffering serious injuries, Lancashire Police said. A spokesman said: "Unfortunately, his condition deteriorated in the early evening, and he subsequently died." A lorry driver was killed when his vehicle collided with an oncoming car on the A49 at Woofferton and then plunged down an embankment. Fire crews cut him free, but he was pronounced dead at the scene on Thursday. Police said the weather had had a "significant effect" on the accident. Have you been hit by the storms?